Yesterday I talked to a man about getting a fake lawn. I now look out my home office window rather guiltily at the horseshoe shaped natural green carpet in my backyard. I know my family wants a place to play, yet this grassy patch will use more water over the summer than a pool of the same size. And we are on the hook to reduce our water use by 25% compared to last year because of the drought. So I am actually considering pulling the whole thing up, laying down some gravel, and covering it with the equivalent of a backyard "toupee." Meanwhile, I'm committed to letting any trees just die if they can't make it through the summer without irrigation. view from Pepperwood's Dwight Center, photo by Lisa Micheli. Given that my work at Pepperwood exposes me to a lot of data about where water is used and perhaps wasted in our region, I'm acutely aware of the fact that outdoor irrigation of rural residential yards like mine are probably one of the chief culprits of water waste, and where we could achieve the greatest savings without compromising drinking water or agricultural water supplies. And that all the water we consume without recycling creates a deficit somewhere in our natural system that won't be refilled until the next time we get a good old-fashioned rainy season. This is the kind of nexus between personal choices and community resilience being forced upon us in the face of the drought. In our region, water awareness is now at an all time high. 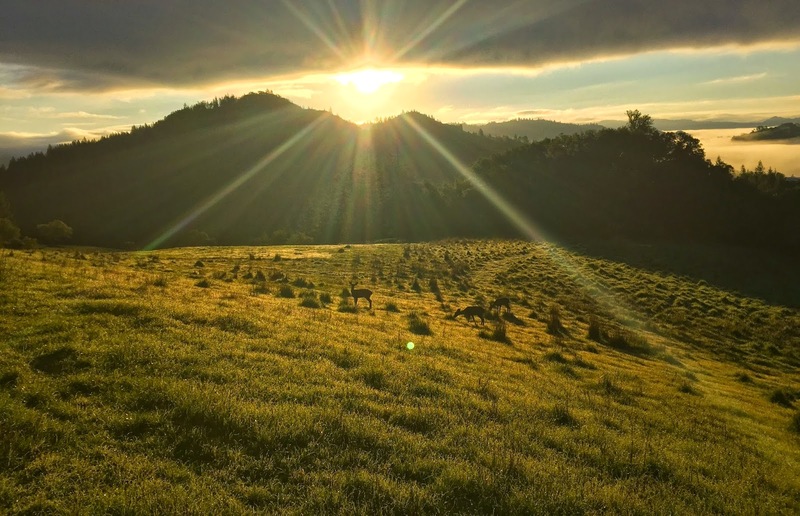 For example, next Wednesday I've been asked to present on the drought and what we can do about it at my town's local environment commission, then Friday at a conference dedicated to the watershed of the Napa Valley. This is a more and more typical week for me as our community ponders two questions: "how bad will it really get?," which requires a crystal ball to answer, and "what am I willing to give up?," which requires some serious soul searching on the part of each one of us. I notice most people opt to talk more about the former than the latter. 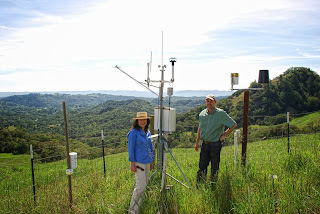 Ackerly of UC Berkeley at one of Pepperwood's weather stations. 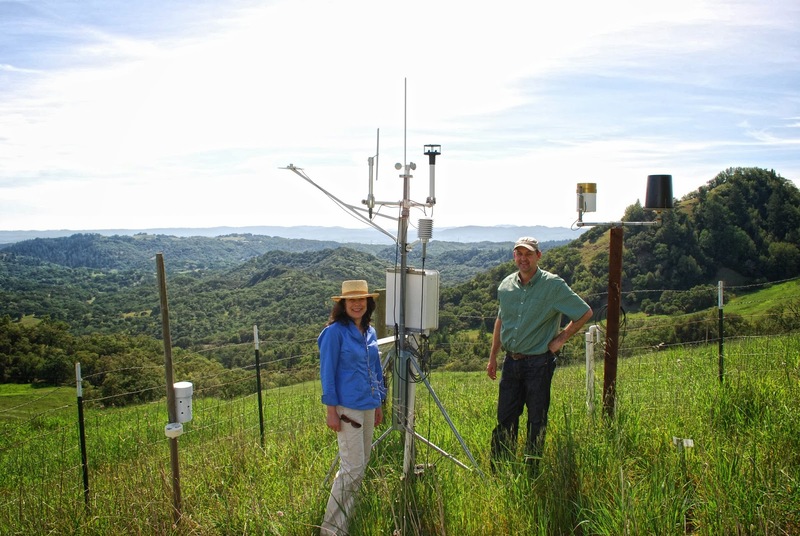 Pepperwood's TBC3 research team is using computer models to explore how much "droughtier" our future may be as a result of climate change. What the models show is what you intuitively know: warmer weather helps to dry things out. So as temperatures continue to rise, the effect is something like aiming a blow dryer on high heat at the Earth. The result is increasing the total amount of evaporation, or where plants are growing, evapotranspiration (the combination of direct evaporation plus water used by the plants). For the North Bay, all of the models, even the ones with significantly higher than normal rainfall, suggest that on average an additional 3 inches (or so) of rain per year will be vaporized due to higher temperatures than compared to today. In some places that amounts to an additional 10% of incoming rainfall being lost due to warming. So this means that water, the most precious of perhaps of all resources for life, is getting only ever more precious. I get inspired by those cultural creatives like our friends at Daily Acts who are figuring out how to make water conservation and recycling both fun and social, rather than an overwhelmingly weighty moral conundrum. So besides tackling the lawn, I am finally going to do what I've been planning to do for years but never got around to - and that is put in a laundry-to-landscape system. What the heck is that you may ask? It's a simple plumbing solution to take the water used by my washing machine and route it directly to irrigate my front yard. And this year that's all the roses are going to get (we stopped irrigating the front lawn years ago, letting it go "rough"). Oh - and I'm ordering a load of mulch to help keep as much water in the ground this summer as possible. So what are your water-wise solutions? How can you make it fun and get your neighbors to help or even try it out themselves? How much easier will we all breathe and sleep when we are successful in leaving smaller footprints on the planet?